Franklin is frosted in snow-white layers and is one of the toughest years to find in Cameo! NGC has certified 238 examples in PF 69 but there are only 14 certified in PF 69 STAR. The jet-black fields are pure perfection! 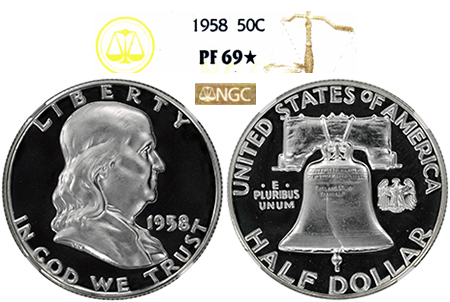 Finding a 1958 proof Franklin with deep, pitch-black and flawless-to-the-eye mirrors coupled with any hint of Cameo devices is a rare treat for this year!